Project Considerations: Transformers + Pads, Weight = 29,000 lbs. ea. All the transformers were mounted on individual 15 ft. x 8.5 ft. x 8 in. thick precast pads which were partially supported on precast cabling vaults and lean concrete structural support on the unloaded side of the pad and compacted earth on the loaded side. The settlement to the loaded side of the transformers caused the pad to tip on the inside edge of the concrete vault. 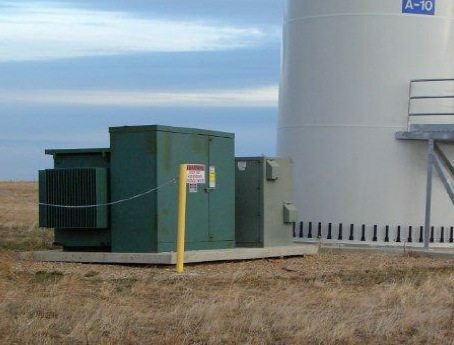 Settlement had occurred within one and a half years of installation and was determined to be due to combination of factors including insufficient compaction surrounding the transformer pad location and freeze thaw cycles. Voids were present in varying degrees under all of the slabs. Concerns about how to return the two worst transformers to level, coupled with questions about material containment in the target area and mechanical stresses on the precast transformer pad were addressed and described under Proposed Solution. URETEK ICR proposed two solutions. The first addressed stabilization of soils below each of the transformer pads. The second ensured a sure, steady, and complete lift of the two worst pads to level, coupled with void fill and soil stabilization. The eight pads which had settled <1.5 inches were slated to have URETEK DEEP INJECTION® work performed with the goal of stabilization of sub soils to prevent future settlement. Although lifting back as close to original grade was a goal, it was not specified as the ability of the soils to keep the material contained could not be determined prior to application. • A single depth injection was performed at 4 locations parallel to and approximately one foot from the settled edge of the pad. 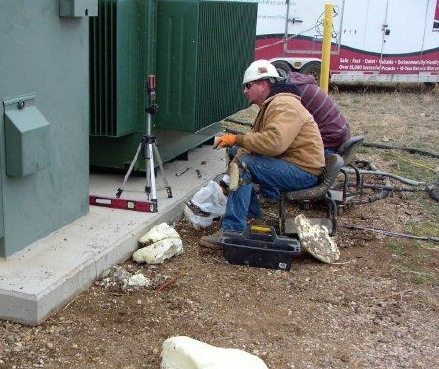 • A secondary injection was performed by angling the URETEK DEEP INJECTION® probes at an approximate 45˚ angle, placing the injection point under the transformer pad. It was determined prior to submission of the proposed solution that the precast transformer pads were capable of bearing the weight of the transformer while under lifting stresses from the outside unsupported edge of the pad. Therefore mechanical lifting options were incorporated, in the two worst cases, to provide a an assisted lift assuring that material containment issues were alleviated. • Four 20 ton mechanical lifting devices were dug in and spaced along the settled side of the pad with load distribution taken into consideration. • Lifting surfaces were covered with wood to prevent direct contact with the pads. 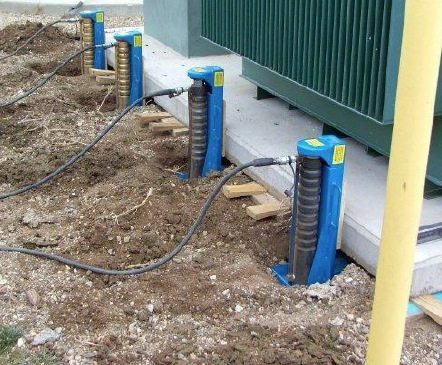 • The mechanical lifting system easily lifting the slab to within 1 inch of desired grade. • Pads were chocked and the lifting devices un-weighted to ensure the slab would remain at desired grade during void filling operations. Upon verification of stability, closed cell expanding polymer material was injected into the void space below the pad and allowed to set. • Finally, all chocks were removed and URETEK DEEP INJECTION® process was used as described above. Three days were allotted for project completion.